Medion is no longer the only game in town when it comes to well-featured, low-cost notebooks. Online store, Kogan, has just announced the availability of a 14-inch Windows 8.1 laptop (called Atlas X14FHD) that can be bought for $359 plus the delivery cost. It’s a laptop that features a dual-core Intel Pentium N3540 processor with a 2.16GHz frequency (2.66GHz in bursts), which, based on previous laptops we’ve tested with similar processing power, can provide more than decent performance for common tasks such as Web browsing, creating documents, and viewing videos and listening to music. It’s basically more powerful than an Intel Atom and Celeron, but not as speedy as a Core M.
There is 2GB of low-power DDR3 SDRAM by default (and you can upgrade to 4GB for $10 more), and internal storage is a 500GB, 5400rpm hard drive. External drives and peripherals can be plugged in to its three USB ports (one of which is USB 3.0, the other two are USB 2.0), and networking is via Gigabit Ethernet and 802.11ac Wi-Fi. You also get Bluetooth 4.0. Other built-in features include an SD card slot, an HDMI port, VGA, headphone and microphone ports, a webcam, and a 4-cell, 32 Watt-hour battery. The screen has a native resolution of 1920x1080, which is very good for the price point. In terms of value for money, it’s similar (if not better) to what we’re used to seeing from Lenovo-owned Medion, in particular, which sells its laptops periodically through Aldi supermarkets. 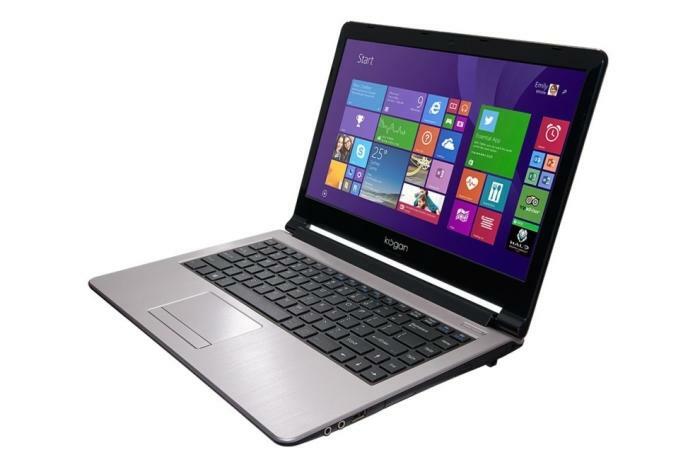 Medion most recently sold a Core i3-based, 15-inch notebook, for $529. Kogan’s 14-inch Atlas notebook has a stated weight of 2kg, a thickness of 23mm, and is available now from Kogan’s site. It’s eligible for a Windows 10 upgrade when the time comes.